Happy Monday! It was such a great way to wake up this morning and see that our team had successfully helped Josie and Bart from Mac Cutting Boards fund their small business loan through Kiva Zip!!! Our Trusteeship with Kiva just began a few months ago and we are so very proud to already have two of our SF Etsy team members take advantage of this amazing micro-funding loan process to help them grow their businesses. Learn more about SF Etsy's Trusteeship by reading this blog post. 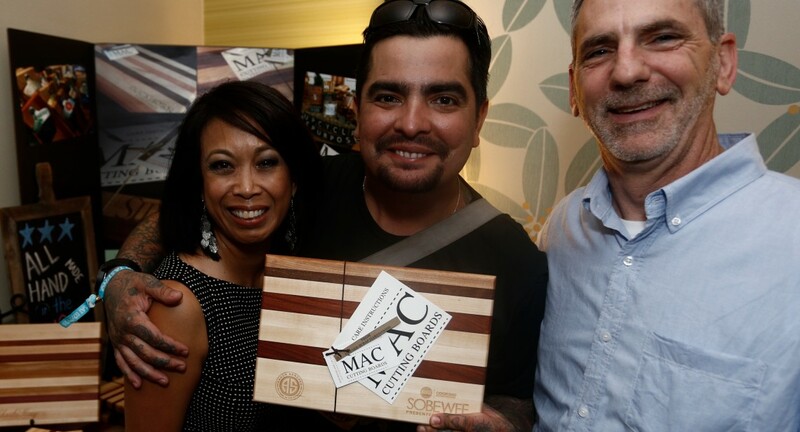 I wanted to take this time for all of us to get better acquainted with Josie and Bart from Mac Cutting Boards. If you haven't met them in person, you should definitely introduce yourself when you see them at a show. They are truly some of the best humans you could ever meet. Bart and Josie McHale are the owners of Mac Cutting Boards. A family owned business since 2009. We handcraft custom made wood cutting boards from repurposing and upcycling unused scrap hardwoods that we sourced from woodworkers such as cabinet makers, furniture makers, hardwood flooring companies and moulding companies. 2. How did you first get started as a maker in the handmade community? In 2009, we decided to include our whole family in making Christmas gifts for our friends and family. We decided on cutting boards and made 28 of them. They were so well received, we started getting orders for more and we never stopped making them. 3. What do you find most exciting about being a maker and working with makers, entrepreneurs, and artisans? Taking something like the scrap wood we use and turning it into something beautiful and useful is what keeps us going. We recently moved into a co-op shop with 5 other craftspeople. Being around them on a daily basis is so inspiring. Not to mention the ability to learn from them on a daily basis is endless. 4. What do you find most challenging about owning your own business? Owning your own business is a 24-7 commitment. At times it can be difficult to obtain funding when large orders come in and we need to purchase raw materials. 5. Tell us about another special maker/artisan you've met while working on your business? Brady & Liz from West Kept Secret http://westkeptsecret.com/. They make and market metal calendars and to-do boards. You can personalize your calendar with numerous choices of magnets. There based in Phoenix Az and travel the west coast selling and promoting their products. In between shows there in their shop producing more inventory. 6. How did you learn about SFEtsy? We met Marja Huhta from Glass Elements at a craft fair in Los Altos. She took the time to tell us about SF Etsy and she was instrumental in introducing us to SF Etsy members. 7. What is one of your primary goals for your business in 2015? We'd like to see continued growth of our company and an increase in our product line. We just hired a part time person to assist us in the shop and we'd like to add another person by the end of the year. 8. What’s the one online tool you've discovered that can help makers propel their business? Today there are many options for online growth. Are favorite is Instagram. It gives us the ability to market our business to a worldwide audience. 9. Do you have any words of wisdom to help makers sell more in person at events? Be engaged with potential customers. Tell them your story. We're always amazed by crafters who do not engage each and every person that passes by there booth. Remember that each person is an opportunity to practice your technique and perfect your performance. Use that few seconds to pitch your product and make a sale. Ask for help. You'll find that our community alone will come together to help each other out. 10. Where can we find you online? A HUGE Thank you to Josie and Bart! We are so very proud to have you on the team and we look forward to seeing you continue to grow and blossom! Antony Gordon lives in a six bedroom, four bathroom rented mansion in Hancock Park. To seek out money, he tells sad stories about his children needing medication and medical care.